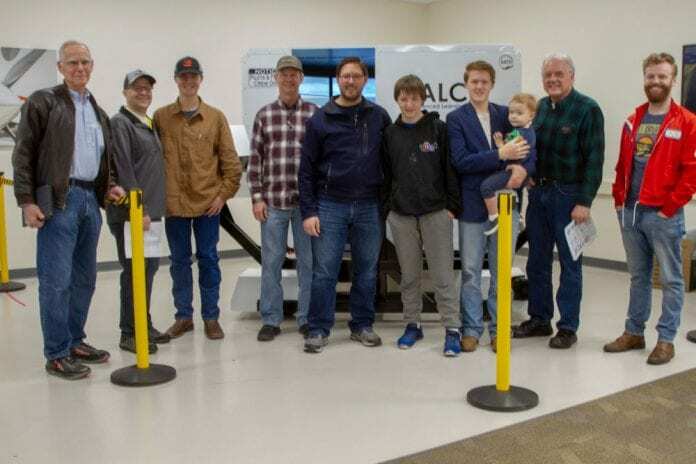 On Saturday morning, March 23, eight pilots from the local Experimental Aircraft Association (EAA) Chapter 753 toured the Nebo School District Advanced Learning Center (ALC) Aviation Program. The EAA was originally started as an association of people building their own airplanes and has now grown into one of the two largest general aviation advocacy organizations in the United States. The Utah County Chapter of the EAA is a very active organization and asked the ALC Aviation instructor Mark Halls to give a presentation about the high school aviation program at their last meeting. It was at this meeting that Mark invited the members to tour the ALC facility and aviation program with eight pilots showing up for a hands-on orientation to the program. First, there was a walk through the ultramodern ALC building and the advanced courses available to excite and stimulate young minds. Students from the six high schools in the Nebo School District can come to the ALC for advanced courses that could not be offered at the individual high schools. In addition to Aviation, other courses include 3D graphics/Animation, Architecture & Construction, Robotics, Criminal Justice, Computer Programing, and Film/Audio Engineering. Most important is the ability of the students to receive college credit for their studies at the ALC. Aviation instructor Mark Halls discussed the aviation curriculum and the teaching aids that the course has available. Within the aviation program five courses are offered; Aviation History, Air Transportation, Private Pilot, Flight Simulator, and Unmanned Aerial Systems. The star attraction was a flight simulator that replicates the cockpit and flight characteristics of a Cessna 172. This flight training device has a 160° visual display that displays the local scenery. The simulator also has motion to replicate the pitch, roll and yaw of the airplane. Every visiting pilot got an opportunity to “fly” the simulator. All were impressed with what the Nebo School District is offering our high school students. Our community is fortunate to have this educational facility and faculty thanks to the forward-looking leadership of the Nebo School District. For more information about the ALC programs email info-ALC@nebo.edu or call (801) 489-2833. For more information about the local EAA Chapter email info@eaa753.org.